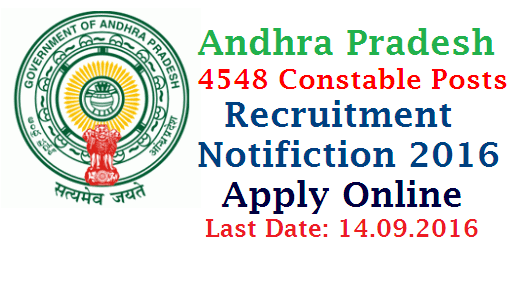 Apply Online for State Level Police Recruitment Board 4548 Constable Posts, Andhra Pradesh (herein after referred as SLPRB, A.P.) invites application through ONLINE mode only in the prescribed proforma to be made available on WEBSITE (recruitment.appolice.gov.in) from 03-08-2016 at 1000 hours to 14-09-2016 at 1700 hours for the following posts. The number of vacancies indicated is only provisional and is liable for change without giving any notice. SLPRB, A.P., reserves the right to notify the modifications with regard to any aspect of recruitment during the process of recruitment. The Candidate will be required to submit (Upload) a copy of photo, signature and community certificate (for BC/SC/ST candidates) while submitting Online Application Form.The Preliminary Written Test will be held on 16.10.2016(SUNDAY) from 10.00 AM to 01.00 PM. (3 hours). The registered candidates may download their Hall Ticket from the website 10 days before the date of Preliminary Written Test.